We offer the most effective, affordable and professional Pet Taxi Booking Service in New York. Welcome to Pet Taxi New York! Our pet taxi booking service in New York City is available 24/7 for pet transportation (with and without owners) . Through our booking service you can request transportation for you and your pet for vet visits, single trips and airport picks ups / drop offs to and from all 5 boroughs of NYC. Upstate and long distance service is available upon request. We are pet professionals since 2007 and the work is done with caring and love! Book and reserve your trip online or use send us a text or instant message to request more information and availability. Can I travel in your car along with my pet? Yes, you can. All our partner vehicles are minivans with enough space for you and your pet. Our booking partners use both minivans and sedans. If your dog is over 50 pounds we usually book a minivan. When going to or from the airport, we always book minivans with plenty of space for you, your pet, her crate and your luggage. Why booking with you instead of booking a car service directly? Most car services do not take pets. But trough years of relationship building, we now have a network of car service partners and work with the very specific drivers on each car service that welcome pets. The drivers who get it! This allow us to offer rides for you and your pet even on short term notice! Are you insured to transport pet & humans? We are a pet taxi booking service, we are not a taxi service. However car services in our network are fully insured and licensed to work in the car service industry. This gives you peace of mind. Are your cars set up for pets only transportation? No. All our partner car services are set up to transport humans. 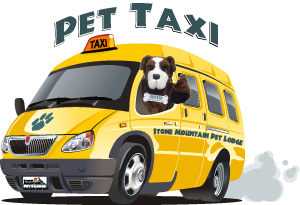 Pets are welcome and we usually book minivans for enough space for you and your pet to travel in comfort. Can you transport my dog, even if I am not traveling with him? Yes, we offer this service, however we require at lest 24 hours notice. Please emails us first your request at service@pettaxinewyork.com or use a Instant Message Operator to find out availability and cost. I would like to book a round trip to the vet, how does it work? When you book a round trip to the vet, our partner car service driver will take you to the vet. Since times at vet are hard to predict, we ask you that when you are getting ready to finish your vet appointment, send us a text or contact our Instant Message operator to let us know you are ready. We can then get a driver to pick you up, usually within 10-15 mins after we receive your text/ instant message. How much notice do you need for a pick up? If you have booked a service that for some reason we are not able to meet, you can request and get a full refund of your payment. Also any service cancel with at least 48 hours notice is entitled to a full refund. We take all major credit cards on our website via PayPal. Yes, all service are subject to NY sales tax. When booking, our system will automatically add cost of tax. Do you add tips to the price I am paying on my booking? No. We never include tips on our prices. Tips are totally voluntary after and only after a great service. "Thank you guys for your flexibility on my pick up last Sunday. I found you guys through the ASPCA website, I will be recommending your services to all my dog friends!" "Thanks Pet Taxi New York for taking my dog to the airport. Your easy to book online service is great! Thanks to you, my baby pug Rosie arrived in L.A safe and sound. Thank you guys!" via text message: (347) 674-6157.